I got 100% on my written test"
Students that take their test not only pass it but the get 100% on it. The reason? Because they understand the rules of the road due to our online drivers education course. , for independence. I've had enough of relying on my boyfriend for lifts. Mum and Dad helped me afford the lessons – they did the same for my brother. My instructor never panics. Even if I stall in the middle of the road, he's really patient and calm. The car is simple to drive and now I know what I'm doing it's easy to find the biting point. My hill starts are getting much better! I started with a two-hour lesson, but I'm doing hour lessons for a while. The EZ Street driving instructor trained me according to the PARENT/TEEN TRAINING GUIDE and HOW TO PREPARE FOR YOUR DRIVING TEST brochure issued by DMV. I think it's really important to find an instructor you're happy with. I can't wait to pass my test. It'll be brilliant! Dave, age 23 – "You can't fault the Toyota Corrola"
Some of my friends have had instructors turning up late or problems with their car. It's much more organised with the EZ Street. You can't fault the Toyota Corrola, it's really easy to manoeuvre and control. My instructor was totally honest about how many lessons I'd need. I got picked up from school or home, and paid him for a block of lessons up front or just lesson by lesson when money was tight. My main problem was reversing around corners. He drummed into me to take my time so I could correct myself if I was going wrong. My advice to anyone thinking of learning to drive? Stick with it. It does become second nature as you learn and practise. 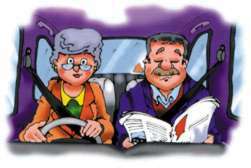 "I got my license revoked due to my age, what can I do now"
Elderly drivers who have had their license revoked chose EZ Street because our instructors are patient, and easy to talk to. We have had numerous students who have experienced a cancellation of their driving priviledges because of their age or minor accidents. DMV offices in Irvine and El Segundo especialize with this types of cases. We know exactly what to do. 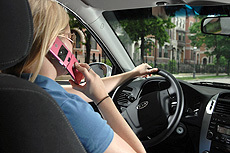 Students who are ready and take their driving test, do pass their test on the first time. If you have a Special Instructional Permit, go for it! Call Us.